Where to Purchase The Best Custom Cabinets! 18 Jul Where Do You Purchase Your Custom Cabinets? So you’re all ready and want to have some cabinetry done in your home. As you’re probably imagining, there are a lot of companies out there but which one do you choose? And what advantages are there by using custom cabinetry or purchasing stock cabinets. Most homes nowadays are getting more compact as real estate prices skyrocket. The need to organize is even more important where every square foot counts! Custom cabinetry takes advantage of every inch whereas pre-made cabinets don’t always just fit and you lose space to multiple large fillers. With custom cabinetry, minimal fillers are needed. Financially, which makes more sense, getting more cabinetry or more fillers? I’ve always found it hillarious when I see brand new cabinetry from a box and realize there is very little structure and funny little metal clips that hold everything together. With custom cabinets Toronto, quality should be the focus. Space Age Closets & Custom Cabinetry uses only Canadian material with the highest gram weight in the business. Our soft-close slides and hinges are also the best in the business so that you can have a lifetime of use not just a few years. I’m constantly amazed that some consumers seem to think that orient-based cabinets are great for them. Most folks don’t realize that these cabinets are dowsed in various chemicals in inhibit insects and other foreign critters. These chemicals, carcinogens, leach into your homes atmosphere and poison the very air your family breathes. 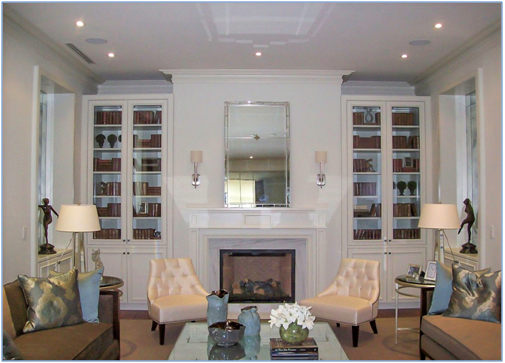 Custom cabinets Toronto offer so many more choices in regards to finishes/textures, colours and styles. Sometimes our customers have a terrible time choosing since there so many choices but it’s always better to have more choices than a limited selection. Our designers have been helping clients for years and really love being able to aid clients not only to organize their homes but beautify them in the same process. I’m not sure about you but I am no carpenter or skilled installer. When it comes to DIY projects, I cringe! When a project is installed by Space Age Closets & Custom Cabinetry, our experienced installers do all of the work you don’t want to do. From being neat, tidy and on time, our installers even clean up after themselves! Let’s say down the road, you want to add more custom cabinets Toronto. Colour matching is something that’s easily accomplished. Since everything is completely custom, we can accommodate almost all of your needs! As is often said, handles and knobs are the jewelry of your cabinets. Not just practical, handles and knobs add that extra sparkle not something mediocre or boring. It’s laudable when we see the same handles being used day in and day out on the out-of-the-box cabinets. Why would you want to use the same handles as your neighbors when you can show your own style!